Even successful companies can’t avoid the chore of filling open managerial positions. Usually, it’s easiest to promote somebody from within. That high-performing salesperson looks like a strong choice – he’s bringing in a stream of new clients and blowing past his sales goals every month. Since he’s among the best of your employees, he’d be an obvious pick for that managerial role – right? Well, not always. Many organizations run into trouble when they don’t realize it often takes different skills and characteristics to succeed as a leader than it does to succeed in a non-leadership role. By hiring based on previous success alone, you could turn that top salesperson into the worst boss your employees have ever seen and wind up derailing your department or your entire company. He might have been a dynamic salesman, but he could turn into an absent leader. Absentee leadership – also called non-leadership, or a destructive form of laissez-faire leadership – is often overlooked in business and academic studies, even though research shows it is the most common cause of job performance degradation. But employees are all too familiar with the concept. Many negative Glassdoor reviews show absentee leadership in (in)action. In summary, absentee leaders are people who hold leadership positions even though they’re not fully engaged in the role. Their lofty and well-paying job titles and descriptions may include some form of the word “management,” but their teams suffer without direction or feedback. Usually, this drain on morale and motivation lingers for years because the consequences are difficult to detect. Absentee leaders generally don’t draw attention to themselves with ethical violations or bad behavior that result in complaints to HR. Instead, their negative influence is deemed low-priority at worst and continues to quietly build and wear away on their team’s effectiveness. Employee stress. 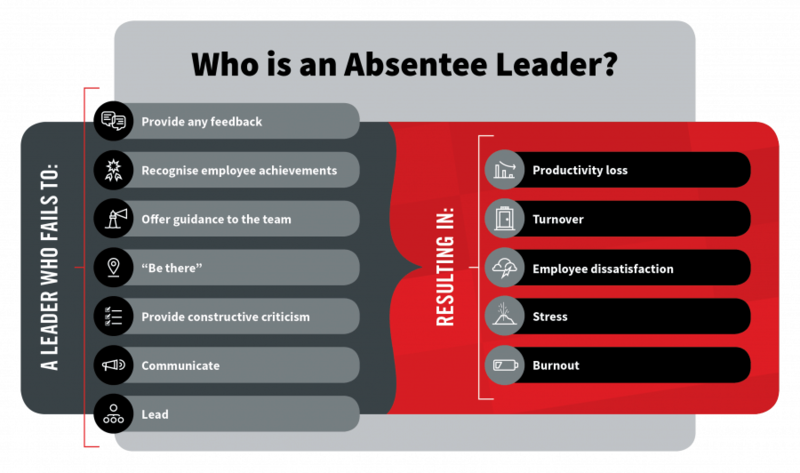 Absentee leadership can cause an array of day-to-day frustrations for employees, including uncertainty about their role, physical stress, burnout or even bullying from fellow team members. Lingering job dissatisfaction. The cumulative effects of the lack of engagement can ruin employee morale even more than your stereotypical angry and overdemanding boss. Destructive leadership will immediately affect employees, but the effects will become milder over six months. The negative effects of an absent leader take longer to appear, but they tend to last for at least two years, or four times as long. Talent drain. Since most employees will feel demotivated without leadership or evaluation, they will soon start looking for another place where their efforts and skills will be rewarded. Greater costs. Absentee leadership isn’t just annoying, it’s expensive. Because absentee leaders destroy job satisfaction and increase ambiguity and turmoil on teams, they cost organizations millions of pounds in terms of turnover and lost productivity. So what’s the solution? How can you recognize you have an absentee boss in your team before the damage is done? Absentee leadership, by its nature, can only be spotted through the vacuum it creates. As of now, personality assessment tests, which can otherwise determine workforce personality traits or predict future performance, don’t automatically measure the warning signs of an absentee leader. However, leading assessment companies are working to change that. For example, the accredited psychologists at Hogan Assessments have identified absentee leadership as a key area of study and is carrying out extensive research. The company is looking at characteristics of absentee leadership by identifying personality attributes Hogan’s core assessments already measure, such as high levels of caution and low levels of assertiveness or decisiveness. In the absence of formal assessments for absentee leadership, you should be on the lookout for what a leader doesn’t do, instead of what they do. Another way is to keep an eye on how their subordinates are doing. If you see any mysterious increases in turnover or drops in job satisfaction or productivity with seemingly no logical cause, your company might have a leader who isn’t really there. About the author: Scott Gregory, is the CEO of Hogan Assessments.